Terrific. Deep garlic flavour, smooth finish. Comes together well with an immersion blender. Dusted with pimenton and served with fried shrimp. Makes a couple of cups but can be repurposed with lemon or vinegar as a fatty vinaigrette. We paired this with pork ribs and the result was delicious. The currants and spice compliment the sweet of the small onions and the tang balances the whole nicely. A very nice recipe! Would make again. I added a squeeze of half a lemon to enhance the taste. Delicious. Wow, so simple I cant believe I’ve never done this. Now I make them often and used them to perk up almost anything. The sauce for this chicken is divine. It's a lot lighter in flavor than the recipe would suggest but the flavor is quite good. The chicken was cooked properly. The only downside is that the skin of the chicken doesn't brown so it's quite flabby (and looks nothing like the picture in the book). I'd remove the skin before cooking in the future. Fantastic!! The sauce puts this over the top. It’s light, but full of flavor. A terrific reminder of how aggressively you can season good pork. Followed the method here more than the ingredients, though did manage to incorporate most of the herbs called for, but mixed in to some salsa verde I had in the fridge which brought anchovies etc to the party. Could deglaze here to make a nice pan sauce if desired. Delicious. Really nice dish. Easy enough for a weeknight, and combination of flavors is great. Nice and creamy, with some brightness from the lemon. Leftovers were delicious too! Confounding ratio - three fennel to 6 radishes, and makes an absolute pile. Dinner for 8 and we had about half of it. Flavours decent but I’ve had many better fennel salads. Good flavour and decent dish. Texture on the pork belly/trotter is going to be tough for some. I'm not a huge celery fan, but I liked this quite a bit. It was easy, good, and refreshing. Worth a re-do! This was a disappointment, less than the sum of its parts. I think I would brown the cauliflower or cook with a little stock to make a turmeric-butter sauce, finish with lime juice, or do both. Roasted cauliflower in the oven before adding to the pan. Used lime leaf powder instead of whole leaf. I made it with homemade pasta. I thought it was quite good. Terrific condiment, carries great Sichuan numbing heat. Only complaint is mine didn’t colour. These we dynamite, juicy pork and big chunks of poached shrimp. I delegated the making so can’t speak to method, but the results were fabulous. Froze well. Really can’t think of a good reason to to make 1000 of these. Used commercial wrappers. Cooked in duck stock. 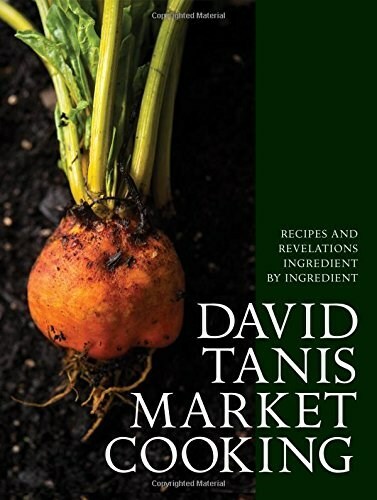 David Tanis' Market Cooking was one of my top 2017 books. Everything about this book screams comfort and vibrancy. This book is about seeking out the best ingredient and exploring the best ways of cooking it, pulling from all the world’s great cuisines. So whether it’s Louisiana Dirty Rice, Persian Jewel Rice, Chinese Sticky Rice, Arroz Valenciana, or Italian Risotto, you learn the qualities of each ingredient (the long and the short of it!) and the best methods and recipes for showcasing what makes it special. Sections on universal ingredients—such as garlic, onion, and shallots—offer some of the simplest yet most satisfying recipes in the world. Consider the onion in these three marvelous incarnations: Lebanese Caramelized Onions, American Buttermilk Fried Onion Rings, and French Onion and Bacon Tart. And the chile section encourages readers to use real chiles (rather than reach for bottled hot sauce each time) on an everyday basis in recipes from Hungary to India, from Mexico to China, with wonderful results. Surprises abound in this vast recipe collection (over 60 percent of which are vegetarian or vegetable-based), such as Tanis’s unexpected happy nod to the value of leftovers: he offers scores of suggestions to morph them into dishes every bit as delicious as the meal in which they originally appeared.